Very well made and does what it is supposed to do. It leaked a bit the first time I used it, but not since. This process is much faster than dry tumbling and gets all residue. Looking at other company's wet tumblers on YouTube, and the CED is great. It's more expensive, but has more features. I imagine it's better made, as well. For testing, I decided to process all my 9mm cases (around 7,000 cases) that had been tumbled in walnut media in a Dillon CV-2001 vibratory tumbler for 24 hours in several batches. The exteriors were free of carbon and dirt, but dusty. I pour the brass into a pillow case to slide them around to remove the dust on the outside of the brass. Then I’d spray on Dillon lubricant on in batches. They were then resized and deprimed in a Dillon 650. The cases were then returned to the Dillon tumbler in batches and tumbler in corncob media for a final polish and to remove the lubricant. I had hundreds of old cases that were heavily tarnished black. No amount of vibratory tumbling would remove this black patina. These had spent decades out in the desert. After tumbling, many of the cases had media stuck in the flash holes. My test was to tumble these processed cases in the CED Tornado to see how much dirt and carbon could be removed. Using tap water, 3.5 pounds of stainless media, the recommended amount of Lemonshine and Lyman Turbo Sonic Cartidge Case Cleaning Solution. I tumbled in the rotary tumbler for the max run time of 3 hours. The tumbler was set to change directions every 15 minutes. After the three hours of tumbling, I began pouring out the solution through the supplied strainer lid, the liquid was black as coffee and had an astringent smell. I refilled the canister with hot water several times and shook it, pouring it out again until the flushed water appeared clean. I then filled the bottom third of the wet media separator with hot water and poured the brass cases and media into the basket. I found the basket design to be rather flimsy to be honest. The basket relies on the clamshell lid to support the basket at the handles to keep from twisting itself open. The Dillon squirrel cage is much heavier duty but would not work well for dealing with wet media. With the water submerging the bottom part of the CED basket, the unit quickly separates the stainless pins from the cases and gives the cases a good rinse with clean water. If the water is particularly dirty, I’ll dump the water and rinse a second time. I have yet to find a single stainless pin left in my cases. From here the wet cases are then spun in the basket without water. This removes a good deal of water from the cases. The cases are then transferred to the CED Brass Dryer. After a few hours, the cases are dry and ready for their next step. Performance was amazing. The hundreds of blackened cases are so clean I can’t even identify them from the pile of gleaming cartoon gold. The cases are clean inside and out. Rarely do I see a sign of lead deposits from shooting cast bullets. Most primer pockets are squeaky clean. I case gauged about 3000 cases in one sitting, and noted that my fingers showed barely any sign of blackening from handling the brass. Pros: -Zero dust or dust exposure contaminated with lead. The majority of contaminants are washed down the drain. Less dust will be easier on your dies. I’m more comfortable allowing children to help with the loading process when they’re cleaned to a higher level. -Improved performance. Cases are clean inside and out to polished brass. Even blackened cases are returned to like new appearance. -Stainless Steel media doesn’t need to be replaced. -Stainless Steel media doesn’t get stuck in flash holes. -Less dust and carbon means less of each transferring to the press which means less time cleaning the press. -Media can be picked up with a magnet. I put a plastic bag over a magnet to pick up what falls out of the rotary basket. Then you just pull the magnet out and the media falls off. -Media sinks in the water. This allows for other contaminants to rise above and be washed out. Cons: -Higher initial cost for equipment. -Drum sizes are smaller than vibratory tumblers, but speed is significantly increased. You’ll spend more time shuffling brass loads. -Cases require drying - repurposed food dehydrators work well. I never towel them off or wipe them down. -Water conditions may leave water spots or deposits of dirt,carbon on the cases if they aren’t flushed with enough clean water. -Stainless Steel media can get trapped in certain rifle cases. -Steel cases rust and corrode quickly, ie: S&B steel case. These type of cases should be tossed anyway. -The lid design of the CED Tornado could be better. If you don’t get the latch just right, it will leak. -Rotary tumbling is louder than vibratory tumbling. I stuck mine in a detached shed so it isn’t an issue. -CED media separator basket is poor quality and may break with heavy use. The handles act like a worm screw migrating water and stainless pins out on to the floor. -Wet tumbling cases with old primers may chemically fuse them to your cases if you don’t remove them quickly. Clean brass = lemi shine, simple as that. Just measure it out to get consistency shining brass with your wet tumbler. Everything OK. I got the goods. I have no complains on the shipment. Typical excellent shipping and service from CED. The drum leaks a little so I have to use it in the laundry tub, but other than that, it works GREAT. Brass is now cleaner inside and out in less time. The steel pins take a little getting used to but with a decent media separator and a magnet they can be managed. I would definitely recommend CED and the Tumbler to anyone serious about reloading good ammo quickly. ... endlich da, Preis ist i.o und die Ergebnisse sprechen für sich selbst. First, couldn't ask for better service, shipped promptly and quickly. Set up was a breeze and the results are outstanding. This unit was certainly well thought out and for cleaning brass! the features are simply ideal, the results couldn't be better. I'm a happy camper. 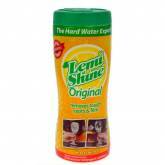 I use 1 spoon lemi shine in my wet thumbler the cases come out clean and dry up without spots on them. 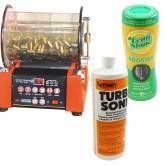 The CED Brass Tornado, Pro Series Tumbler, is the ultimate tool for brass cleaning! It is the most advanced wet rotary tumbler on the market today! It incorporates features and functions never offered before, setting this Rotary tumbler high above the competition. With this Tumbler it is now possible to “fine-tune” the brass cleaning process, the time spent, and the results achieved. More and more shooters are switch over from the conventional vibratory dry tumblers to Wet rotaty tumblers. The wet cleaning method works best with a totally tumbler fitted with a water tight horizontal drum to hold the brass cleaning solution and stainless pin-type media. Through extensive testing, CED has developed an excellent cleaning combination of stainless steel media, water, Lemi Shine, and Lyman Turbo Sonic Cartridge Cleaner, which when combined results in glistening clean brass cartridges, inside and out, including the primer pockets. Our recommended combination, even seem to remove “water spots” and residue leaving shinning, spotless brass that look like new! The tumbler consists of a re-sealable watertight drum, a driving system base on which to place the drum, and a motor to rotate the drum at ideal speeds of 40-60 RPM. The speed is important - too fast and centrifugal force will cause the cases and media to cling to the sides of the drum with virtually no cleaning action whatsoever. Too slow, and the cleaning process is inefficient and extremely time consuming. This is one of the single failures of other rotary tumblers on the market today. They offer only a “fixed” speed. Unfortunately, depending on the weight of the contents being cleaned, the drum will spin at different speeds. The CED Brass Tornado solves this problem by offering variable speed selection from 5 to 100 RPM, allowing the user to select a faster speed for heavy loads or a slower speed for smaller load sessions. The CED Brass Tornado is designed with a hexagon shaped drum, which dramatically improves the cleaning process by creating more “tumbling” movement of the cases as they rub against each other and the steel media, which in turn removes all of the fouling and thoroughly polishes the cases inside and out, including the primer pockets when de-primed cases are in use. The CED Brass Tornado a custom designed filtration cap that allows easy rinsing of the brass from the dirty water solution before separation and drying. Also included are 3.5 lbs. of stainless steel media, and a spare sealing O-ring. The CED Brass Tornado comes with a complete two year warranty, and CED stocks a full line of replacement parts / accessories if ever needed. This booster works excellently on brass cartridges as well, producing “like new” results. Works great when combined with Lyman Turbo Sonic Cleaning Solution. Cleaning with wet Rotary Tumblers or Ultrasonics requires the correct solution for the correct cleaning application. Lyman has partnered with a renowned chemical research team to develop the right solutions for use with today's new Cleaners. 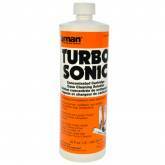 The Turbo Sonic case cleaning solution was formulated to deliver premium results in cleaning cases inside and out. The 32oz. value sized concentrated solution is the ideal way to save while producing "like-new" results. - Value Sized 32 oz.